This article is adapted from a talk that Caltech vice provost and professor of physics and applied physics David Goodstein presented at an April 29 program of the Institute support group, the Caltech Associates. Goodsteins new book, Out of Gas: The End of the Age of Oil, was published in February by W. W. Norton. In the 1950s, it was not Saudi Arabia but the United States that was the worlds greatest producer of oil. Much of our military and industrial might grew out of our giant oil industry, and most people in the oil business thought that this bonanza would go on forever. But there was one gentleman who knew better. He was an oil exploration geologist named Marion King Hubbert. In about 1950, Hubbert realized that the trajectory of oil discovery in the continental United States was going to be a classic bell-shaped curve, for the decades from 1910 to 1970, in billions of barrels per year (see figure 1, below). He also saw that there would be a second bell-shaped curve that would represent production, or consumption, or extraction. The oil industry likes to call it production, but the industry doesnt really produce any oil at all. It does, however, reflect the rate at which we use the oil up. Perhaps you could call it supply. Hubbert realized that using what he knew in 1950 about the history of discoveries, along with what was already known about consumption, and a little mathematics, he should be able to predict that second bell-shaped curve. And so he did (see figure 2, below). The red, bell-shaped curve is the kind of curve he predicted. The black points are the actual historical data, and the uppermost point represents what has come to be known as Hubberts Peak. Obviously, he was doing something right. The situation worldwide is a little less well-determined. A third graphic provided by the energy conglomerate BP, shows what the worlds known crude oil reserves are (see figure 3, left-hand graph, below). The amount that we have now is a trillion barrels of oil. So people in the industry might say, we have a trillion barrels just sitting there waiting to be pumped out of the ground; were using it up at a rate of about 25 billion barrels a year, and so we have 40 more years to gotheres nothing to worry about. But as Hubbert has shown us, thats the wrong way of looking at it . Before we leave that curve, though, I want to point out that a sudden jump of 300400 billion barrels of oil in OPEC (the Organization of the Petroleum Exporting Countries) reserves occurs in the late 1980s (see figure 3, left-hand graph, above). But there were no significant discoveries of oil in OPEC countries during that period. What happened instead is that OPEC changed its quota for how much each country could pump on the basis of what it claimed in reserves, and politicians discovered 400 billion barrels of oil without ever drilling a hole in the ground! This helps us to understand how undependable these numbers are for worldwide proven oil reserves. As you can see, the curve that traces the historic record of oil discovery peaks around 1960. In other words, Hubberts peak for oil discovery came and went 40 years ago. The curve for oil usage, as you can see, is a rising curve and will become a bell-shaped curve eventually. Note that for the last quarter century, weve been using oil faster than we have been discovering it. World reserves should have decreased during that time by about 200 billion barrels. Instead, as weve seen, theyve increased by 400 billion barrels. In any case, it should be possible, given this much information, to make a prediction similar to the one that Hubbert made for the continental United States for worldwide oil production. One such estimate was published in 1998 in Scientific American. It predicts that we will have a worldwide maximum in oil production just about nowaround the middle of the decade 20002010. What will happen when we reach that peak we dont really know. But we had a foretaste in 1973 and 79 when the OPEC countries took advantage of the supply shortage in the United States and shut down the valve a bit. What happened, as you may recall, is that we had instant panic and despair for the future of our way of life, and mile-long lines at gas stations. We dont know whats going to happen at the next peak, but we do know that those past peaks were artificial and temporary. The next one will not be artificial and it will not be temporary. However, we have to use caution in evaluating these types of predictions. One crucial quantity that goes into making such an estimate is knowing how much oil Mother Nature originally made for usthat is, how much oil was in the ground before we ever started pumping it. The Scientific American estimate used 1.8 trillion barrels of oil as the baseline number. Today it looks like 2.12.2 trillion barrels might be more accurate. That numberthe total amount of oil that ever existedtends to increase with time for a variety of reasons. First, new technology and new discoveries have exactly the same effectthey both make more oil available. Secondly, as oil becomes scarcer and the price goes up, more oil becomes available at the increased price, because you can invest more capital into pulling it out of the ground. And finally, these estimates depend to some extent on those proven reserve numbers and, as weve already seen, those numbers are not very reliable. Nevertheless, the central idea of the Hubbert Curve is certainly correct: the supply of any natural resource invariably rises from zero to a maximum point, and then it falls forever. Oil will behave in the same way. In 1997, Kenneth Deffeyes, a former Shell Oil geologist whos now an emeritus professor of geosciences at Princeton, published a book he entitled Hubberts PeakThe Impending World Oil Shortage. In it, Deffeyes said he knew that Hubbert had been right and that the peak for domestic production had been reached when he saw this sentence in 1971 in the San Francisco Chronicle: The Texas Railroad Commission announced a 100% allowable for next month. To demystify that sentence, the Texas Railroad Commission was the quaintly named cartel that controlled the U.S. oil industry by making strategic use of the excess capacity for pumping in Texas. When the commission said, 100% allowable for next month, it meant that there was no longer any excess capacity. They were pumping flat-out, and therefore Hubberts Peak had been reached. Ever since reading this, Ive thought that the signal that the worldwide peak had been reached would be when we found out that Saudi Arabian production had peaked. For the last few decades, the Saudis have been using excess pumping capacity to manipulate the world oil market in exactly the same way the Texans once did. Well, on February 24 of this year, a story appeared on the front page of the New York Times entitled Forecast of Rising Oil Demand Challenges Tired Saudi Fields. Among other things, the article said that Saudi Arabias oil fields are in decline, prompting industry and government officials to raise serious questions about whether the kingdom will be able to satisfy the worlds thirst for oil in the coming years. This is a New York Times story, so its very long, as many Times stories are, and its written in a style in which each successive paragraph is contradicted by the next paragraph. This is called balanced reporting. Sure enough, much farther down in the article, we find these words: Some economists are optimistic that if oil prices rise high enough, advanced recovery techniques will be applied, averting supply problems. But here comes the contradiction in the next paragraph, But, privately, some Saudi oil officials are less sanguine. I dont know whether we will look back years from now and say that this was the beginning of the end of the age of oil. Were much too close to it to tell, and our figures are, overall, much too uncertain. But, to those people who are aware of the Hubberts Peak predictions, as the writer of this article apparently was not, this was a chilling report. Economists tell us that there can never be a gap between supply and demand because the process is regulated by price. Thats never been true in the case of oil, because it has always been controlled by cartels, first in Texas and later by OPEC. However, once the peak occurs, OPEC will lose control of the situation, and the price mechanism will kick in with a vengeance. But the supply can keep up with the price only if there is something to supply. Im sometimes asked, what about replenishing our oil reserves through deep-ocean exploration? Im already factoring in close-to-shore oil production, but the deep oceans are essentially unexplored and, its true, we dont know whether theres any oil out there. Over the last hundreds of millions of years, oil typically has been manufactured in places that are rich in life, which deep oceans are not. But the landmasses have moved around over geologic time, so there may be deep-ocean oil reserves. Even so, deep oceans are technically extremely difficult places to drill for oil. That leaves us with only two remaining reservoirsthe South China Sea, which currently has seven countries claiming mineral rights to it; and Siberia, which has very bad access problems. And those resources, of course, are finite also. So lets see what else there is to use, aside from oil. The word oil covers more than just the conventional light crude that weve been pumping up to now. It also covers heavy oil, oil sands, and tar sands. Heavy oil is essentially whats left behind in the field after you pump the light crude away. And, of course, if you put more money inthats the price mechanismyou can usually squeeze a little more oil out of any field. But its both more costly and more time-consuming to get that oil out. And the more you pump out, the heavier it gets. Natural gas could be a very good substitute for oil. Cars that are not very different from those we drive today can run on compressed natural gas, and its a particularly clean-burning fuel. But if we turn to natural gas in a major way to replace diminishing supplies of oil, it will only be a temporary solution. The Hubbert Peak for natural gas is only a decade or so behind Hubberts Peak for oil. Oil was created when so-called source rock, full of organic inclusions, sank deep within the earth. The inside of the earth is heated by natural radioactivity, and the deeper you go, the hotter it gets. This source rock sank just deep enough into the heated interior for the organic matter to get cooked into oil. Rock that sank deeper got overcooked and became natural gas. Rock that sank to a more shallow level became shale oil, which is essentially unborn oil that can be made into a fuel by strip-mining, crushing, and heating the rocks until you generate a usable liquid. People who have invested many millions of dollars into trying to exploit this resource have come to the conclusion that it will probably always be energy-negative, meaning that you will always have to put more energy into acquiring and processing it than you will ever get out of it. Methane hydrate is a solid that looks like ice, but that burns if you ignite it. It consists of methane trapped in a sort of cage of water molecules and it gets created when methane comes into contact with water under very high pressure at very low temperatures close to the freezing point of water. Nobody has any idea of where all it is, how much there is, whether it can be mined, or how it could be usedall we know is that this stuff exists. Finally, there is coal. We are told that there is enough coal in the ground for hundreds, maybe even thousands of years, at the present rate of use. The fact that these estimates range over a factor of ten tells you immediately that nobody has the foggiest notion of how much coal is actually available. But even those projections might be considered reliable, compared to the second part of that optimistic sentence: at the present rate of use! Well get to that in a moment. The largest coal deposits are in the United States, and China and Russia have very large reserves as well. Coal can be liquefied and made into a substitute for oil. That was done in Nazi Germany during World War II, and in South Africa under apartheid. That alone should tell you that you have to be fairly desperate to do it, but it can be done. But, coal is a dirty, dirty fuel. It often comes with nasty impurities, including mercury, arsenic, and sulfur. The mercury that accumulates in the bodies of tuna or swordfishand which has led to FDA warnings to limit our consumption of these fishoriginates in coal-fired power plants in the United States. We use now about twice as much energy from oil as we do from coal, so if you wanted to mine enough coal to replace the missing oil, youd have to mine it at a much higher rate, not only to replace the oil, but also because the conversion process to oil is extremely inefficient. Youd have to mine it at levels at least five times beyond those we mine nowa coal-mining industry on an absolutely unimaginable scale. And even that doesnt take into account the worlds increasing population, or the fact that nations like China and India want to have a higher standard of living, which means burning more energy. Finally, it doesnt take into account the Hubberts Peak effect, which is just as valid for coal as it is for oil. Long before we have mined the last ton, we will have started to deplete our ability to get the stuff out of the ground. So, its a very good bet that the governing rate of use number I mentioned earlier is not hundreds or thousands of years, and that no more than one-tenth of that timeframe represents a realistic estimate. What all this suggests is that if we accept the economists solution and just let the marketplace do its thing as we make use of all the fossil fuel we can, well start running out of all fossil fuels by the end of this century. How about hydrogen? Both President Bush and California governor Schwarzenegger have publicly embraced hydrogen as a solution to our fuel problems. But there are only two commercially viable ways of making hydrogen. One is to make it out of methane, which is a fossil fuel. The other is to use fossil fuel to generate the electricity that you need to electrolyze water and get hydrogen. The economics of doing that are such that you end up using the equivalent of six gallons of gasoline to make enough hydrogen to replace one gallon of gasoline. So this solution is not a winner in the short run. In the long run, if the problem of harnessing thermonuclear fusion can be solved and we have more power than we know what to do with, you could use that form of energy to make hydrogen for mobile fuel. Ill get to that a little later. There is also wind power, which many now see as a viable energy alternative. And it is, but only to a limited extent. In regions like northern Europe, where fossil fuels are very expensive and the wind is really strong, wind power will someday come to rival hydroelectric power as a source of energy. But there are relatively few places on earth where the wind blows strongly and steadily enough for it to be a dependable energy source, and people dont really like wind farmstheyre ugly and theyre noisy. Wind power will always be a part of the solution. But its not a magic bullet. Its not going to save us. In recent years, the debate over nuclear power has revived, with proponents maintaining that we can find environmentally sound and politically acceptable ways to deal with the waste and security hazards. But even assuming that to be true, the potential is limited. To produce enough nuclear power to equal the power we currently get from fossil fuels, you would have to build 10,000 of the largest possible nuclear power plants. Thats a huge, probably nonviable initiative, and at that burn rate, our known reserves of uranium would last only for 10 or 20 years. As things stand today, the only possible substitutes for our fossil-fuel dependency are light from the sun and nuclear energy. Developing a way of running a civilization like ours on those resources is an enormous challenge. A great deal of it is social and politicalwere in the midst of a presidential election, and have you heard either party say a word about this extremely important subject? But there are also huge technical problems to be solved. So, you might well ask, what can Caltech do to help? The ultimate solution to our energy problem would be to master the power of controlled thermonuclear fusion, which weve been talking about doing for more than half a century. The solution has been 25 years away for the past 50 years, and it is still 25 years away. Beyond those sobering statistics, there are at least five or six schemes for harnessing fusion energy that I know of. One of them, called the spheromak, is studied here at Caltech in an experimental program run by Professor of Applied Physics Paul Bellan and his research group. In the spheromak, electric currents flowing in a hot ionized gasotherwise known as a plasma-interact with magnetic fields embedded in the plasma. As these fields and currents push the plasma around, new fields and currents are created. Theres a sort of self-organizing interaction occurring. 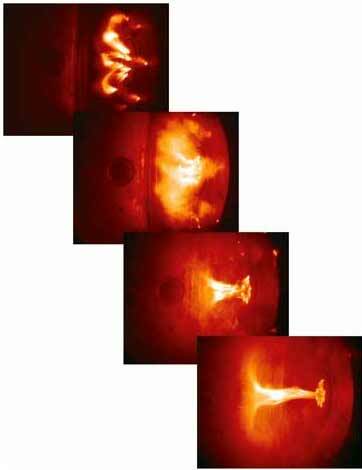 You can see in this sequence of snapshots below, starting from the top, that the plasma is organizing itself into a jet and then a kink develops in the jet. This is something that happens all by itself, and its not something that happens only occasionallythe gas always self-organizes like that. After the kink develops, it breaks away from the body of the jet as a doughnut. If you can find a way to maintain that doughnut and keep it goingthat is to pump in enough energy to keep it from decayingthe doughnut has the perfect geometry required for containing a hot plasma undergoing thermonuclear fusion. But attaining this objective is far off. The existing apparatus is much too small to reach the hundred million degree temperatures needed to generate power. The Bellan team is studying the fundamental physics of the self-organizing process in the hope it can be used to create and sustain the desired fusion plasma confinement geometry in a reliable, controlled manner. Theres another group at Caltech whose efforts are aimed largely at the other alternativesolar energy. Their program is called Power the Planet: Caltech Center for Sustainable Energy Research. Members include applied physicist Harry Atwater, chemists Harry Gray, Nathan Lewis, and Jonas Peters, and materials scientist Sossina Haile. Furthermore, our former provost Steve Koonin recently stepped down from the provostship and took a leave of absence from the Caltech physics faculty to become chief scientist at BP. BP, formerly British Petroleum, is one of the largest energy companies in the world, and so he now has one of the most important energy positions in the world. The fact that these and similar scientific and technical efforts are under way at Caltech and elsewhere are encouraging, but they are not enough. What we really need is leadership with the courage and vision to talk to us as John F. Kennedy did in 1960, when he pledged to put a man on the moon by the end of the decade. Its the same kind of problem. We understand the basic underlying scientific principles, but we have huge technical problems to overcome. If our leaders were to say to the scientific and technical community, We will give you the resources, and youright now, even before it becomes imperativewill find a way to kick the fossil-fuel habit, I think that it could be done. But we have to have the political leadership to make it work.